Basic, non-view, economical binder for light use. Binder features back-mounted, non-locking rings. Two inside pockets provide extra storage for loose documents. Poly material is non-stick, so inserts and pockets won't lift print. Do your binders have a pocket on the front cover to hold a printed page? These are reference binders, so they don't have the clear front pocket for title pages. You need Universal View Binders. 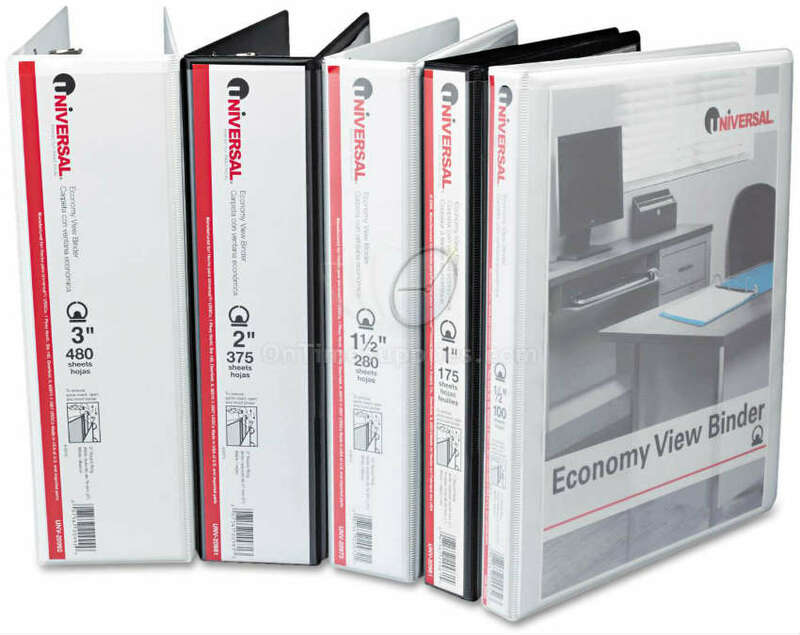 View binders have clear plastic pockets on the front covers and spines for cover sheets and spine labels. Can I have our school logo printed on the binder? Thank you very much for your note. We do not do any printing or imprinting on binders, however, we do have a lot of customers who will buy binders from us on-line and then ship them to a local printer. That method seems to work well for most of our customers because they can purchase our binders at wholesale rates and then the customer can inspect the logo and art work in person. We have over 40,000 business supplies for quick shipping and wholesale business supplies to keep your business going for less. Please call or e-mail us if there is anything else we can do for you. by Pierre from Naples, Fl. We are very happy with the binders and the quality of the same, thank you for your quick service and for the quality of your product.